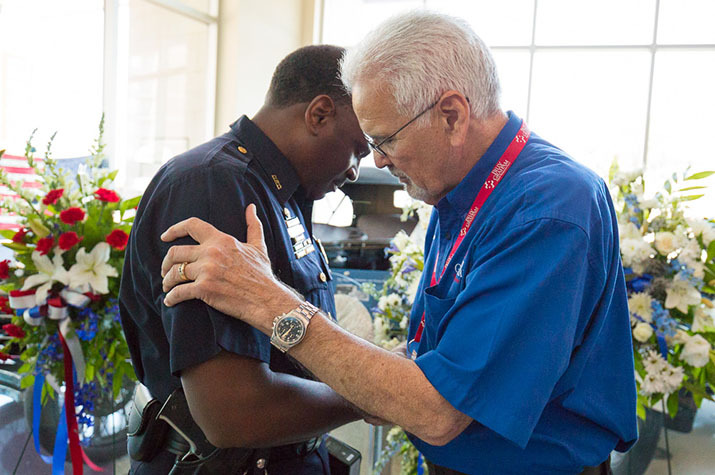 The Billy Graham Rapid Response Team addresses the unique emotional and spiritual needs of law enforcement officers and their families in the midst of disasters and through the annual National Law Enforcement Retreat. Q: I joined our city’s police force about six years ago, and the stress is really getting to me. I am a Christian and I really feel God put me here, but sometimes I get very discouraged. It doesn’t seem like I’m doing any good because the same people keep getting in trouble. What would you say to me? A: I would first of all thank you (and all your colleagues) for your service as a policeman. You have an important and risky job, and your city is a much safer place because of your willingness to serve there. Yes, it’s easy to get discouraged when we try to help people and make this a better world. You’ll always see people you are not able to help, or you’ll focus on those who don’t change—and you’ll wonder if you’ve wasted your time. (Pastors know all about this, as do others who spend their lives trying to help people.) Remember: Jesus knows what it is to have people ignore Him. If God has called you to this position, thank Him and ask Him to help you be the best policeman possible. We seldom know the full impact we have on others—but God does, and He works in ways we will never understand this side of eternity. The Bible says, “Live a life worthy of the calling you have received” (Ephesians 4:1). It also says, “Whatever you do, work at it with all your heart, as working for the Lord, not for men” (Colossians 3:23). In addition, learn to relax and get away from your pressures. On one occasion, Jesus told His disciples, “Come with me by yourselves to a quiet place and get some rest” (Mark 6:31). Jesus needed rest—and so do we. Looking for lasting peace in a chaotic world?